to purchase materials needed for her furniture shop. Catalina benötigte 575 US-Dollar, um ein Gewerbe im Bereich Fabrikation auf- oder auszubauen. Das Geld wurde gesammelt und für Catalina bereitgestellt. 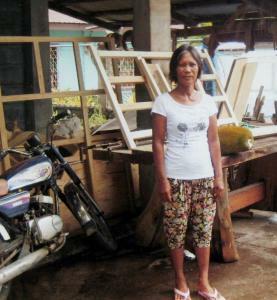 Catalina, 62, is from San Mateo, Isabela, and married with two children. She has owned and managed a furniture shop for almost 17 years; the shop makes cabinets, tables, chairs, and many more items. Her net income from this business is PHP 10,000 monthly, which she spends on her family's daily expenses. Due to inadequate capital in her business, she would like to avail herself of a loan from Alalay Sa Kaunlaran Incorporated of PHP 30,000 to purchase materials needed for her shop. She's hoping that her business will continue to improve and become more profitable.